CSIRO, in collaboration with UNSW, has designed a new PhD program to deliver work-ready, industry-focussed researchers to bridge the research-industry divide. Australia has strong research capabilities, but relative to other OECD countries, faces a number of barriers in translating research excellence into innovative products and services. With a low number of researchers in industry when compared with similar countries, declining rates of STEM education participation and limited opportunities for industry-focused research training, Australia is lagging on international innovation indices. 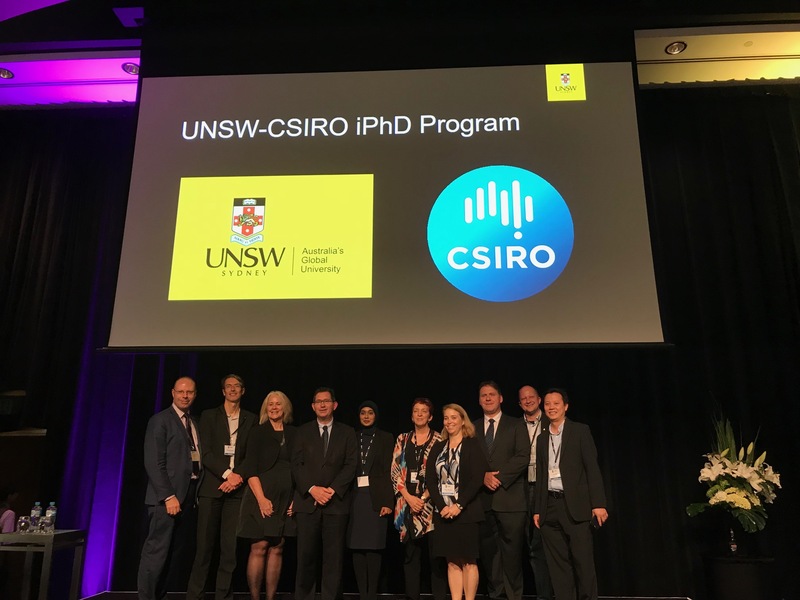 That’s why CSIRO and UNSW has created the Industry PhD (iPhD), a program that aims to coordinate and bring together universities, businesses and the CSIRO to jointly train new researchers to solve real-world challenges. The iPhD program is intended to generate tangible benefits for industry and the national economy and help build the ‘next-gen’ workforce – to create research leaders who will understand the needs of industry and enable collaboration across the innovation ecosystem. The first pilot program involves nine industry partners, who, in collaboration with UNSW and CSIRO, offered eleven research projects in the areas of data-centric society, manufacturing, materials and energy. The selection process for the pilot program ran between August to November this year, attracting over 100 high quality applicants from diverse backgrounds. Industry PhD projects are closely related to Industry partners’ demands and interests. Each project involves a four-way partnership between the PhD candidate, a business, a university and CSIRO, leveraging the capabilities and experience of each partner. We seek to scale up disruption of the national research training system by involving industry throughout the development and delivery of the PhD program. PhD candidates will collaborate with their industry partner throughout the program to understand and solve a designated industry challenge, as well as do a six-month internship. They will receive industry-relevant training, including leadership, entrepreneurship and innovation. CSIRO and the universities will provide access to world leading researchers and infrastructure. Candidates’ engagement with industry partners will significantly improve their employability and capacity to contribute to the innovation ecosystem. The response to the pilot program call for applications exceeded initial expectations considering it was restricted to domestic applicants only. The successful recruitment campaign demonstrates significant interest in industry-research interaction with applicants declaring that “it is different to every other PhD degree out there, working side by side with industry”, and “this scholarship offers a very unique combination of industry and research experience”. To apply for the CSIRO iPhD program, stay tuned for next rounds to be announced through the program’s website. Poole-Warren, ‘Three-sided PhD to bridge the university-industry gap’, The Australian.